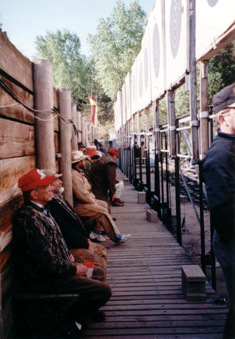 These are pictures of shooters in the pits at the Winnequah Range in Lodi, Wisconsin. Click on them to see a larger image for a closer look. 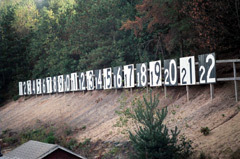 This picture shows the number boards located above and behind the targets at the Winnequah Gun Club in Lodi, Wisconsin. 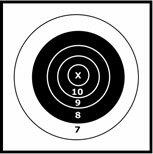 The sandy berm in front of the targets is a great help in determining where each shot has impacted on the target, simply by watching where it impacts on the berm. After a short period of time, you will know when your shooter has scored a 10 or X, and when he or she has missed the target completely. 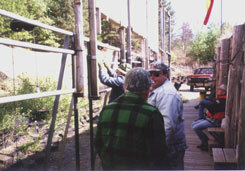 This picture shows some of the hard wok required to have a successful Long Range match. 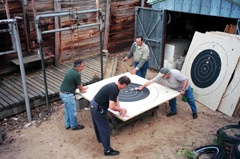 This work crew of 4 shooters is pasting new target sheets over the old sheets on 22 separate target frames. In the picture (starting clockwise from the top of the picture) are Ernie Stallman, Cliff Gregg, Mark McClellan, and Karl Nagel. 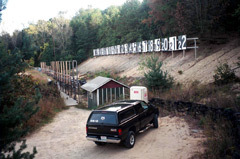 This picture shows the pit area, target frames, sandy berm impact area behind the targets, and the 22 number boards at the Winnequah Gun Club in Lodi, Wisconsin. This picture was taken in the late afternoon on September 24th, 2004 — the Friday before the annual Fall match. 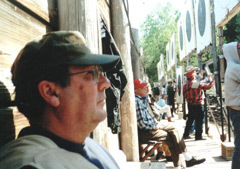 Notice the direction of the light and the shadows that are being cast on the entire target and pit area late in the day. Being in the last relay of the day at the Fall match with the low hanging sun can be brutal on the shooter!